Settlers near Fort Henry had periodically been decoyed into the surrounding hills and killed by an Indian imitating a turkey. The other inhabitants of the area weren't alarmed by the single shot, thinking it was their friend getting turkey dinner. 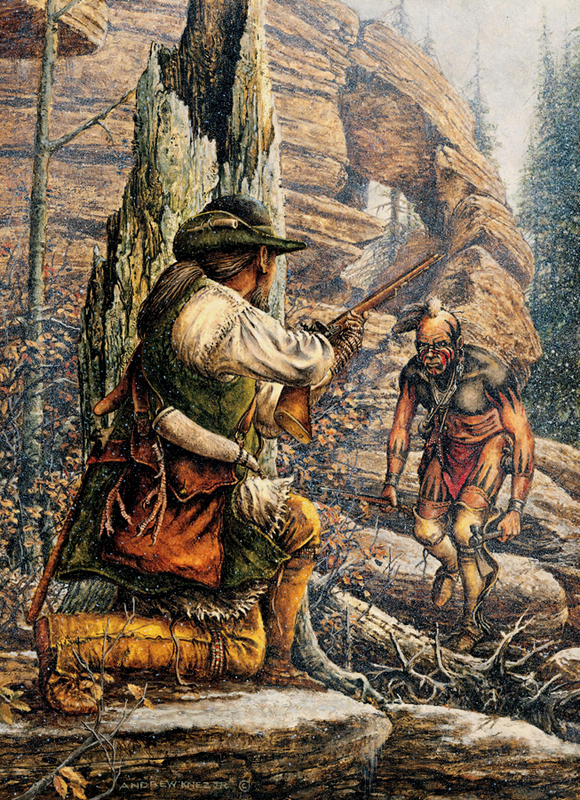 In January of 1783, while everyone was preparing a meal for the "Old Christmas" (January 12th), Lewis Wetzel took two turkey feet, wings, and a drumstick bone with which he fashioned a turkey call and went to an area known to be frequented by the false gobbler. He laid a decoy trail and concealed himself. Shortly, a large Indian appeared, following the tracks and slowly making his way up the hill towards Wetzel. Lewis wanted to be sure of his shot, so he waited until the false gobbler was within a few yards to fire. This event happened near a rock formation above Wheeling Creek, which has ever since been known as "Injun Gobbler Cave".